Mike Flynn is a recognized leader in mathematics education and presents on a wide range of topics at major conferences and events throughout the world. If you have an event and would like to schedule him to speak, please contact his senior administrative assistant, Janet at jpaquett@mtholyoke.edu. Flynn, M. (2018). Understanding resistance in mathematics education: Changing our narrative to foster stronger working relationships. California Math Council North Conference. Monterey, CA. Flynn, M. (2018). Beyond answers: Exploring mathematical practices with all students. California Math Council North Conference. Monterey, CA. Flynn, M. (2018). Beyond answers: Exploring mathematical practices with all students. Mehlville School District Professional Learning Day. Mehlville, MO. Flynn, M. (2018). Harnessing structure on the path toward procedural fluency. California Math Council South Conference. Palm Springs, CA. Flynn, M. (2018). 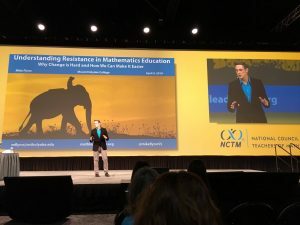 Understanding resistance in mathematics education: Changing our narrative to foster stronger working relationships. California Math Council South Conference (Keynote). Palm Springs, CA. Flynn, M. (2018). Mathematical modeling in science class: Maximizing opportunities to enhance the STEM experience (3-5). NCTM Regional Conference. Seattle, WA. Flynn, M. (2018). Mathematical modeling in science class: Maximizing opportunities to enhance the STEM experience (3-5). NCTM Regional Conference. Hartford, CT.
Flynn, M. (2018). Using robotics to engage in mathematical practices (PreK-5). PD at the Trinity School, Atlanta, GA.
Flynn, M. (2018). Developing mathematical mindsets for teacher leaders. District 49 Professional Learning Day. Colorado Springs, CO.
Flynn, M. (2018). Exploring regularity and making general claims to promote mathematical reasoning (6-8). PD at the Franklin Special School District, Franklin, TN. Flynn, M. (2018). Beyond answers: Exploring mathematical practices with all students. PD at the Franklin Special School District, Franklin, TN. Flynn, M. (2018). Moving past math magic in favor of mathematical reasoning (Keynote). Arizona K-12 Center Summer Institute. Tucson, AZ. Flynn, M. (2018). Using robotics to engage in mathematical practices (K-2). Arizona K-12 Center Summer Institute. Tucson, AZ. Flynn, M. (2018). Exploring regularity and making general claims to promote mathematical reasoning (6-8). Arizona K-12 Center Summer Institute. Tucson, AZ. Flynn, M. (2018). Mathematical modeling in science class: Maximizing opportunities to enhance the STEM experience (3-5). Arizona K-12 Center Summer Institute. Tucson, AZ. Flynn, M. (2018). Using robotics to engage in mathematical practices. National Council of Teachers of Mathematics Annual Conference. Washington D.C.
Flynn, M. (2018). Understanding the resistant teacher: Changing our narrative to fosters stronger working relationships. National Council of Supervisors of Mathematics Annual Conference. Washington D.C.
Flynn, M. (2018). Building a nationwide network of instructional coaches. Association of State Supervisors of Mathematics Annual Conference. Washington D.C.
Flynn, M. (2018). Math tasks in three acts: Real world experiences with mathematical modeling. Arizona K-12 Center. Phoenix, AZ. Flynn, M. (2018). Mathematical modeling in science class: Maximizing opportunities to enhance the STEM experience. Teachers Development Group Leadership Seminar on Mathematics Professional Development. Portland, OR. Flynn, M. (2018). Understanding resistance in mathematics education: Changing our narrative to foster stronger working relationships. Teachers Development Group Leadership Seminar on Mathematics Professional Development. Portland, OR. Flynn, M. (2018). Using robotics to engage in mathematical practices. Kentucky Center for Mathematics Annual Conference. Lexington, KY.
Flynn, M. (2018). Elevating teacher voice to reclaim the narrative in mathematics education. Pennsylvania Department of Education Annual Conference. Hershey, PA.
Flynn, M. (2018). Understanding the resistant teacher: Changing our approach to foster stronger working relationships in mathematics. Pennsylvania Department of Education Annual Conference. Hershey, PA.
Flynn, M. (2018). Harnessing structure on the path toward procedural fluency. PD at the Franklin Special School District, Franklin, TN. Flynn, M. (2017). Using robotics to engage young children in the standards for mathematical practice. Session at the California Math Council North Conference at Monterey, CA. Flynn, M. (2017). Mathematical modeling in science class. Workshop at the NCTM Regional Conference in Chicago, IL. Flynn, M. (2017). Beyond answers: Exploring mathematical practices with young children. MSD of Wayne Township PD, Indianapolis, IN. Flynn, M. (2017). Mathematical modeling in science class. Workshop at the NCTM Regional Conference in Orlando, FL. Flynn, M. (2017). Making mathematics meaningful in K-5 classrooms. Mehlville School District PD, St. Louis, MO. Flynn, M. (2017). Leveraging problem-based learning in K-12 classrooms. Keynote at the Lesley University’s 5th Annual Summer Math Institute. Cambridge, MA. Flynn, M. (2017). Teaching for understanding: Creating meaningful mathematical experiences for students. Keynote at the Arizona K-12 Annual Math Conference, Phoenix, AZ. Flynn, M. (2017). Making use of structure on the path to procedural fluency. Session at the National Council for Teachers of Mathematics Annual Meeting, San Antonio, TX. Flynn, M., Meyer, D., Champagne, Z. (2017). ShadowCon: Extending the conference experience. Featured session at the National Council for Teachers of Mathematics Annual Meeting, San Antonio, TX. Flynn, M. (2017). Using robotics to engage young children in the standards for mathematical practice. Session at the National Council for Supervisors of Mathematics Annual Meeting, San Antonio, TX. Flynn, M. (2017). Making use of structure on the path to procedural fluency. Session at the Association for Teachers of Mathematics in New England Spring Conference. Worcester, MA. Flynn, M. (2017). Problem-based learning in k – 12 classrooms. Session at the Teachers Development Group Annual Meeting, Portland, OR. Flynn, M. (2017). Family math night. Westfield School District, Westfield, MA. Flynn, M. (2017). Beyond Answers book release event. Odyssey Bookshop Author Series. South Hadley, MA. Flynn, M. (2017). Teaching for understanding: Creating meaningful mathematical experiences for students. Keynote for North Allegheny School District, Pittsburgh, PA.
Flynn, M. (2016). Teaching for understanding: Creating meaningful mathematical experiences for students. 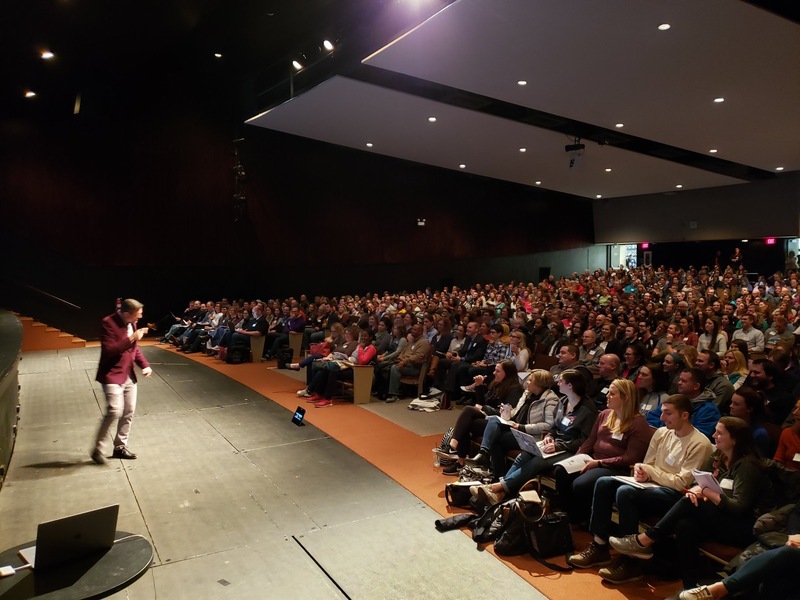 Keynote for Mapleshade Elementary School, East Longmeadow, MA. Flynn, M. (2016). Moving past math magic in favor of mathematical reasoning. Session at National Council for Teachers of Mathematics Regional Meeting, Phoenix, AZ. Flynn, M., Meyer, D., Champagne, Z. (2016). ShadowCon: Extending the conference experience. Featured session at the National Council for Teachers of Mathematics Annual Meeting, San Francisco, CA. Flynn, M. (2016). Beyond answers: Problem-based learning in K – 8 classrooms. Richmond Consolidated, Richmond, MA. Flynn, M. (2016). Problem-based learning in K – 5 classrooms. Morningside Community School, Pittsfield, MA. Flynn, M. (2016). Mathematical modeling: Mathematizing student experiences in the primary grades. Session at the National Council for Teachers of Mathematics Annual Meeting, San Francisco, CA. Flynn, M. (2016). Virtual lesson studies: Connecting teachers for enhanced professional learning. Session at the National Council for Supervisors of Mathematics Annual Meeting, Oakland, CA. Flynn, M. (2016). Virtual lesson studies: Connecting teachers for enhanced professional learning. Session at the Teachers Development Group Annual Meeting, Portland, OR. Flynn, M. (2016). Virtual lesson studies: Connecting teachers for enhanced professional learning. 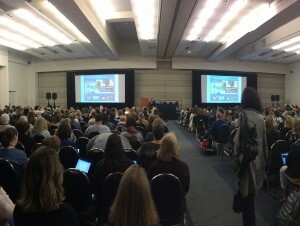 Teaching and Learning Conference, Washington D.C.
Flynn, M. (2016). Creating meaningful STEM experiences for students. Keynote at the Network Connections Conference, Pittsburgh, PA.
Flynn, M. (2016). Building procedural fluency from understanding. New Hingham Regional Elementary School, Goshen, MA. Flynn, M. (2016). Developing interactive classrooms to support meaningful mathematical practices. Abu Dhabi National Oil Company Schools. Abu Dhabi, United Arab Emirates. Flynn, M. (2015). Using a 3-lens approach to professional learning in mathematics. Session a the National Council for Teachers of Mathematics Regional Conference, Nashville, TN. Flynn, M. (2015). Virtual lesson studies: Connecting teachers for enhanced professional learning. Massachusetts Association of Colleges for Teacher Education Conference. Sturbridge, MA. Flynn, M. (2015). Building procedural fluency from understanding. Fort River Elementary School, Amherst, MA. Flynn, M. (2015). Using a 3-lens approach to professional learning in mathematics. Session a the National Council for Supervisors of Mathematics Annual Meeting, Boston, MA. Flynn, M., Meyer, D., Champagne, Z. (2015). ShadowCon: Extending the conference experience. Underground session at the National Council for Teachers of Mathematics Annual Meeting, Boston, MA. Flynn, M. (2015). Using a 3-lens approach to professional learning in mathematics. Session at the Teachers Development Group Annual Meeting, Portland, OR. Flynn, M. (2015). Lifting the curtain on math magic in favor of mathematical reasoning. Session at the Teachers Development Group Annual Meeting, Portland, OR. *Mike’s presentations and keynote addresses prior to 2015 are available upon request.